My GO Senator PC is one of my favourite watches, and at no time whatsoever have I wanted or intended to buy another perpetual calendar. That said, there’s no harm in surrendering to impulse every now and again, and accordingly it now has a sibling in the form of the JLC Master Eight Days Perpetual. 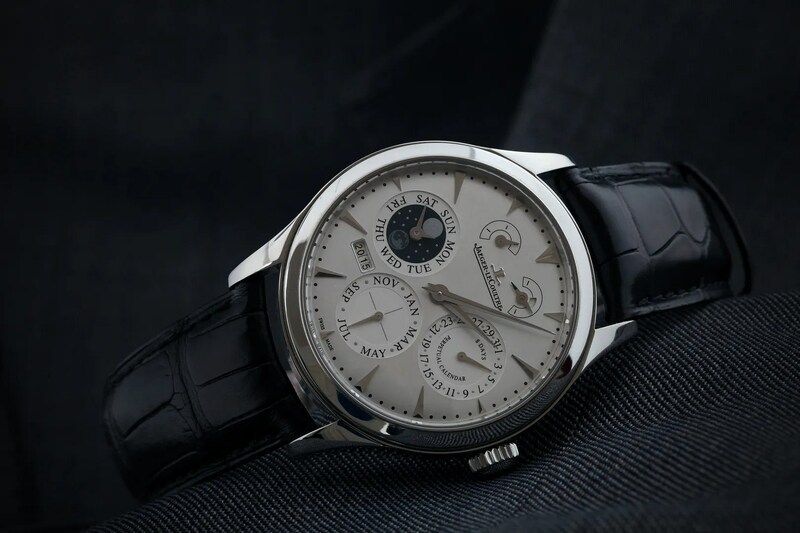 To quote from the JLC website, its “the only perpetual calendar with an 8-day power reserve. Two barrels, 28,800 vibrations per hour and a variable inertia balance wheel. All the perpetual calendar functions (mechanically programmed until 2100) are activated by a single corrector.” I’ll add to that by saying it’s the most sublime watch I’ve owned – breathtakingly beautiful on the wrist, and one that it’s impossible to do justice to in terms of photographs. JLC redesigned their Eight Days Perpetual for launch at Basle in 2012, and this current version is 1.5mm smaller than its predecessor at 40mm with a cleaner dial layout, longer indices and much more elegant lugs; the applied 12 has also gone, and the result is beautifully balanced. 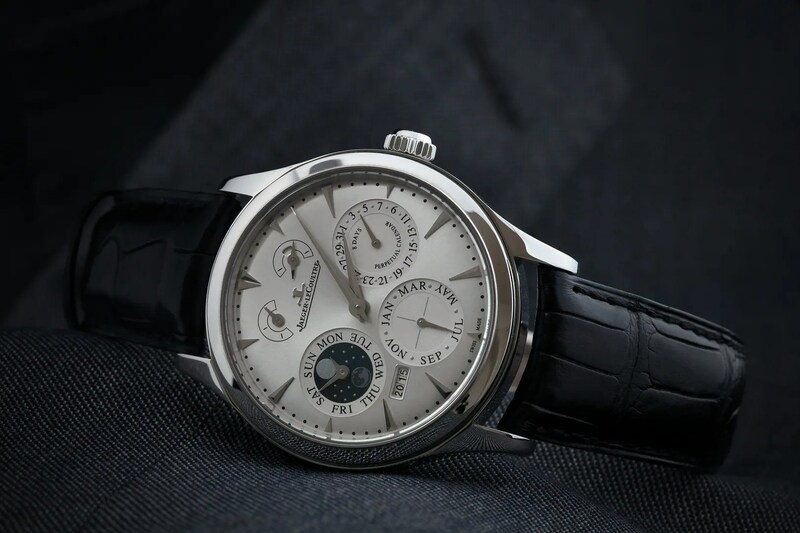 On the dial you have a complete perpetual calendar ( day / date / month / moonphase / year ) and a night and day indicator, which also provides a warning window as a reminder that the date must not be set from 10 PM to 3 AM (when the calendar mechanism is engaged). 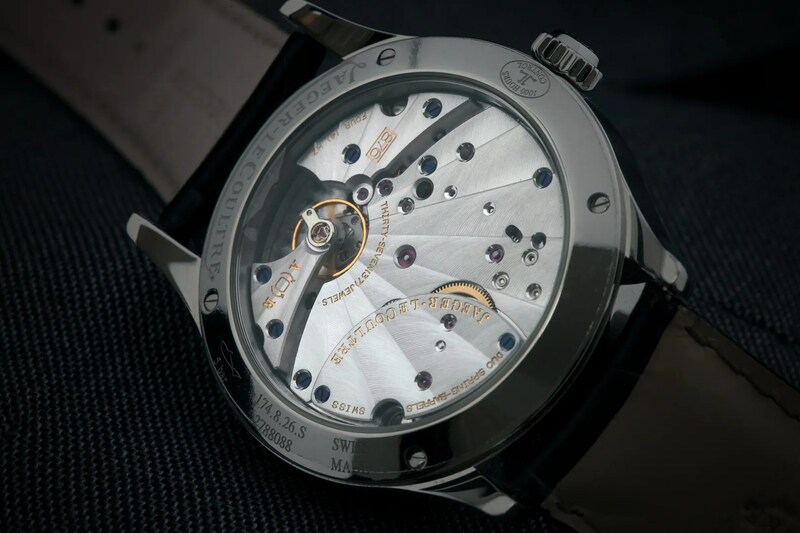 There’s also a power reserve indicator, which is especially important as the movement is a manual wind. The very long eight day reserve means that a weekly wind will keep the calendar set, and all in all it’s an amazing piece of horology. I have a quandary now, because in truth I don’t want two perpetuals; however, I’ve had the GO for more than two years now and have never intended to sell it. 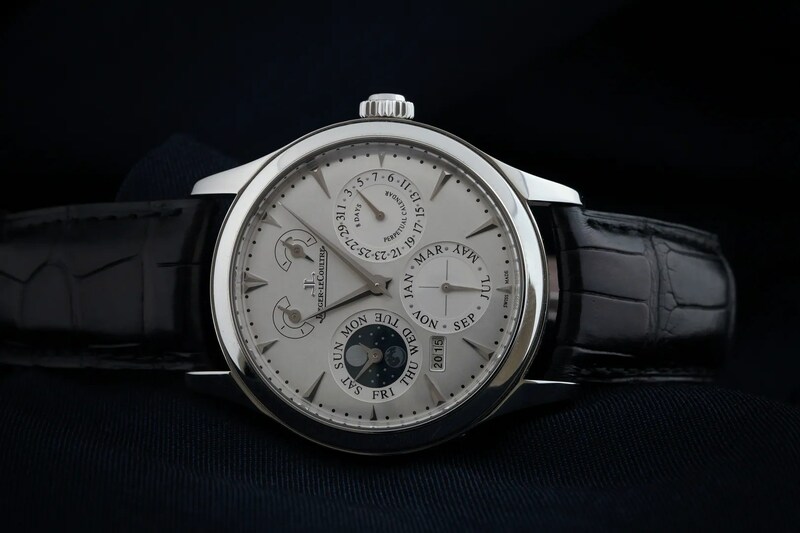 That said, I can’t deny that the JLC is the more beautiful watch of the two… what to do? That was a rhetorical question, by the way, as I’m doing nothing for now. And the obligatory wrist shot! This entry was tagged Jaeger LeCoultre. Bookmark the permalink. 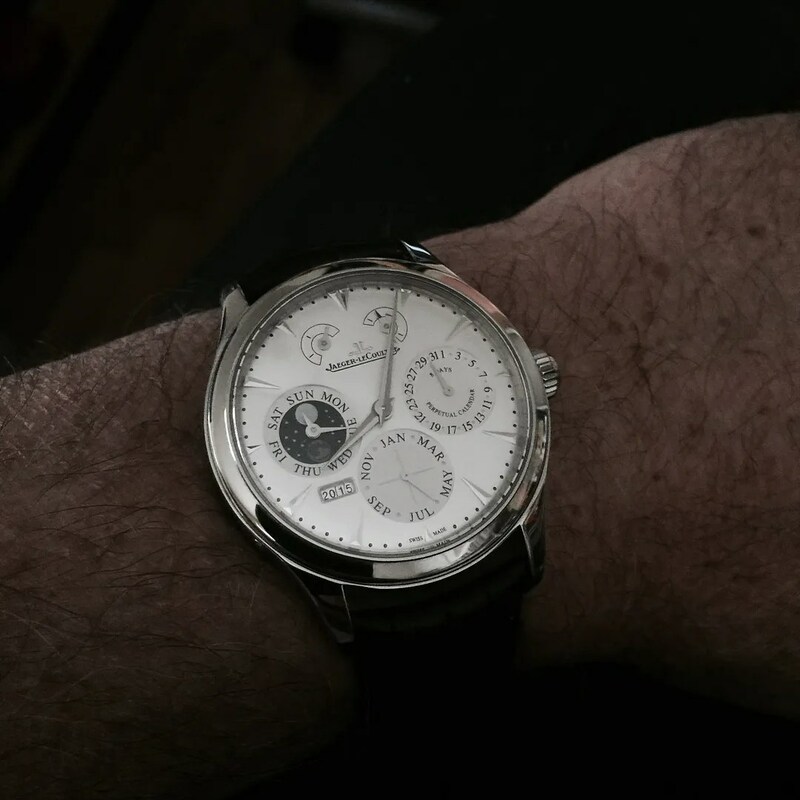 Amazing watch Tony…with pics to match!